A Sunday, the first day that the Bayonne Bridge opened for use to the general public was 28,856 days ago, on November 15th, 1931 at 5 A.M. The Bayonne Bridge was designed by a man who helped design the Hell Gate rail bridge on the East river- and was principal designer for the Verrazano bridge over the Narrows, The George Washingston Bridge over the Hudson River, the Bronx Whitestone Bridge over the East River, the Throgs Neck Bridge over the East River. He was brought in to simplify the design of mighty Triborough– which is actually a bridge and highway complex spanning multiple waterways and islands. A swede, Othmar Amman worked for Gustavus Lindenthal(designer of the the Queensboro and Hell Gate Bridges), and took over as head bridge engineer at the New York Port Authority in 1925. He also directed the planning and construction of the the Lincoln Tunnel. 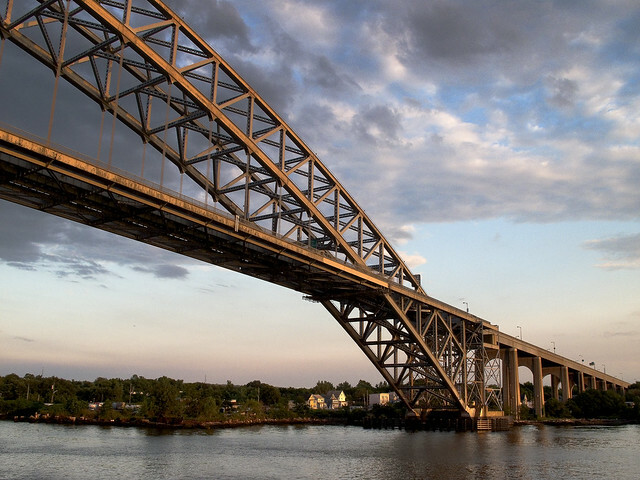 A brutal beauty, the elegant parabola of the Bayonne Bridge is not likely to remain unaltered at its centennial. The Bayonne Bridge is the fourth longest steel arch bridge in the world, and was the longest in the world at the time of its completion. 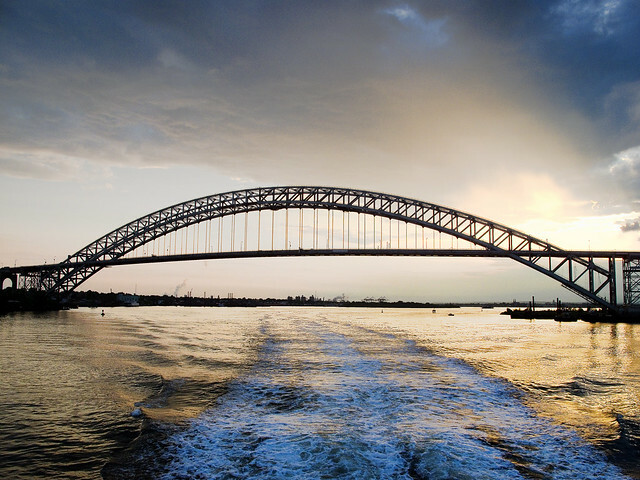 It connects Bayonne, New Jersey with Staten Island, New York, spanning the Kill Van Kull.The bridge was designed by master bridge-builder Othmar Ammann and the architect Cass Gilbert. It was built by the Port of New York Authority and opened on November 15, 1931, after dedication ceremonies were held the previous day. The primary purpose of the bridge was to allow vehicle traffic from Staten Island to reach Manhattan via the Holland Tunnel. A new class of titan ship, the Panamax class cargo carrier, would be stymied from entering Newark Bay and the elaborate port infrastructure which lines its shores by the shallow height of the bridge’s roadway. Ground was broken for the Bayonne Bridge on September 1, 1928. The span is comprised of a two-hinged, spandrel-braced trussed arch in which the bottom chords form a perfect parabolic arch. 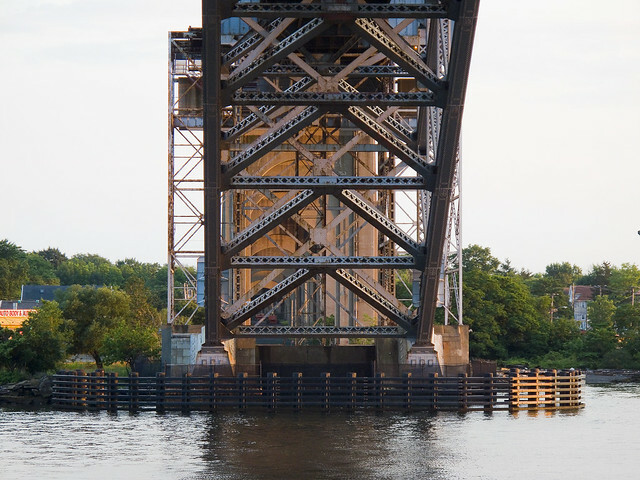 As the span’s primary structural members, these manganese-steel chords carry most of the dead load and uniform live load, which is then transferred to the concrete abutments. The span’s top chords (which were constructed from a lighter silicon steel) and web members are stressed by live loads and temperature. Humorless, the suggestion to lower the water falls on deaf ears amongst those stern and hardened engineers employed by the Port Authority. One can only hope that the solution to the Bayonne Bridge’s height issue can be solved in as elegant a fashion as Othmar Ammann’s original design. In 1931 the Port Authority built the Bayonne Bridge, which connects Bayonne, New Jersey and Staten Island, New York and sits at the entrance of the Port Authority’s maritime facilities over the Kill Van Kull. Due to the increasing size of vessels, the 151-foot airdraft (the distance from the water’s surface to the underside of the bridge roadway) of the bridge presents a navigational challenge to some vessels today – a challenge that is expected to increase as larger ships transit the Panama Canal after its expansion in 2015. 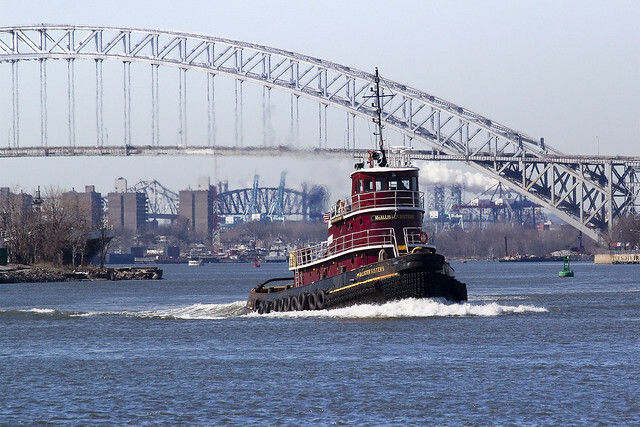 The Port Authority recognizes the importance of developing and maintaining a world class port with deep and clear channels for vessels and the infrastructure to support the movement of cargo. 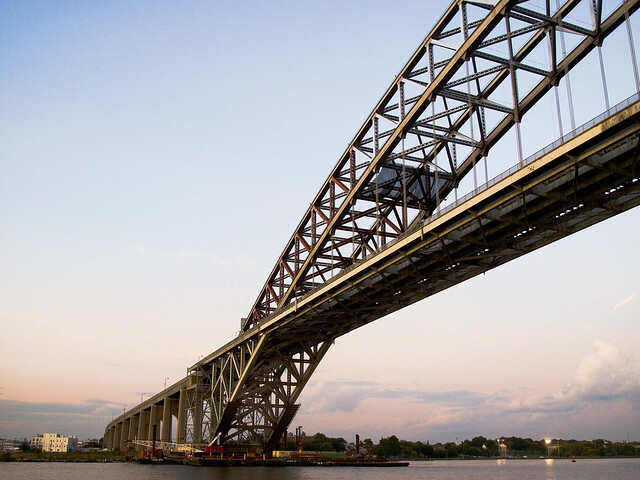 In order to address this navigational challenge, in 2008 the Port Authority commissioned the United States Army Corps of Engineers (USACE) to complete an analysis of the commercial consequences of and the national economic benefits that could be generated by a potential remedy of the Bayonne Bridge’s airdraft restriction. The final report concludes that despite the high cost of possible solutions, the national economic benefits (i.e. the transportation cost savings to the nation) that would result from implementing a remedy would far outweigh the costs. The total project cost of modifying or replacing the bridge could range from $1.3 billionto $3.1 billion and could take ten years or more to complete. thanks for pointing out the birthday.